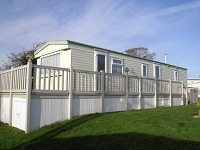 180 Killigarth Manor is a three bedroom holiday caravan set in a beautiful location on the Killigarth holiday park in Cornwall. We are dog friendly. You will have the full amenities of the holiday park, no passes required and no extra charge. Caravan 180 has 3 bedrooms. The kitchen is fully equipped with fridge, cooker, kettle, toaster and a microwave. The adjoining lounge has plenty of seating. freeview tv with dvd. Plus dining area. three bedrooms, a large double with plenty of storage and Two twin bedrooms. The lounge also has a pull out sofa bed. Outside we have a decked area with patio furniture. Local Area - From Killigarth Manor there is a coastal walk to Polperro passing two small beaches with rockpools. Dolphins have been seen off the bay. Visit Smugglers Rest before your return. Healeys Cornish Cyder Farm, Siblyback Lake Country Park, Shipwreck Centre, Zip Wire at Adrenalin Quarry, Kartworld,Jamaica Inn,Bodmin Jail, Porfell Wildlife, The Monkey Santuary, Do not forget the Fishing trips and speed boat rides the list goes on and on but you only have a week. Killigarth Manor Amenities - Visitors can enjoy all the benefits of the amenities at Killigarth from the heated swimming pool, gym room, safe toddlers room, bingo nightly, evening entertainment, pool tables, Wi-Fi internet cafe and several Bars. Dog Friendly Places - Looe has a second beach to the left where dogs are allowed. The coastal walk from Polperro along to Talland Bay stopping at Smugglars Rest. The walk does continue on to Looe (it took me 3 hours but it was worth it. Dogs are welcome at Seaton beach with its sand pebbles and rock pools, also there is a woodland walk. A woodland walk from Looe Milpool car park ( vet is also in this car park) Bodmin Moore just up the road, the Deer Park never seen any deer there it is very rural/rough.The Jubilee Inn (local pub) is only a walk away from the Holiday Home Park. Facilities - Small Children welcome - Off road parking - Dvd, WIFI available, Walk to beach, Fireplace - Gas, Microwave, TV, Deck/ Patio/ Porch, washer dryer. Outdoors: Balcony-. Guide Prices - from £246 per week low season.